The 2012 British Grand Prix was the ninth race of the 2012 Formula One Season, which took place on the weekend of 6–8 July 2012 on the 2011 Arena layout of the Silverstone Circuit, the second running on this layout and 46th at Silverstone. It was the 63rd consecutive running of the British Grand Prix as a round of the Formula One World Championship, the longest such run of any event on the Formula One calendar. Fernando Alonso of Ferrari set pole position, ahead of Red Bull's Mark Webber, in a very wet qualifying session, with an extremely long red flag stoppage in Q2. Michael Schumacher also impressed to qualify in third place. Mark Webber won the race, the final win of his career, eventual runner-up Fernando Alonso in the final stint, less than five laps from the end of the race. Webber's Red Bull-Renault teammate, Sebastian Vettel, came third, while Felipe Massa finishing in fourth to secure his best finish in over one and a half years, when he finished on the podium at the 2010 Singapore Grand Prix. As for the British drivers, Lewis Hamilton came eighth and Jenson Button scored a single point. Hamilton had managed to lead the race during the first round of pitstops, but was never in contention for a race win. Paul di Resta suffered an early puncture after Romain Grosjean clipped one of his rear wheels and was forced to retire. After the European Grand Prix, in which he won with other results going in his favour, Fernando Alonso had taken a commanding lead in the championship, 20 points ahead of his nearest rival, Mark Webber, who finished fourth in the race. The title chase would, though, had a different look to it were it not for Sebastian Vettel's alternator failure, and Pastor Maldonado crashing into Lewis Hamilton and knocking him out of the race. Red Bull-Renault led the constructors' championship by 39 points, ahead of McLaren-Mercedes. Ferrari had closed the gap to Lotus-Renault to just four points. The aftermath of the race had continued onto the grid of the British Grand Prix. Jean-Éric Vergne would take a ten-place grid penalty, while Kamui Kobayashi had incurred a five-place grid penalty. Vergne caused an avoidable collision with Heikki Kovalainen, while Kobayashi did the same to Felipe Massa. On the Wednesday before the race, Marussia test driver María de Villota crashed into a support truck at Duxford Airfield during a straightline test. She was left with life-threatening injuries, but made a strong recovery, and only lost her right eye. Caterham brought several updates to the race. They were not the only ones to bring a major update, Marussia and McLaren did likewise. Three test drivers drove in Free Practice 1. Jules Bianchi replaced Nico Hülkenberg at Force India, Valtteri Bottas replaced Bruno Senna at Williams, and Dani Clos replaced Narain Karthikeyan at HRT. Lotus's Romain Grosjean set the fastest time in a very wet session, ahead of Daniel Ricciardo of Toro Rosso. Third was the McLaren of Lewis Hamilton. Fernando Alonso and the two Force Indias did not set times, and Charles Pic set a time fifteen seconds down on Grosjean. Grosjean's time was 26 seconds down on Mark Webber's pole time at the previous British GP. Many drivers spun, including Clos (twice), Kamui Kobayashi, Timo Glock and Pedro de la Rosa; while Grosjean and Heikki Kovalainen ran off-circuit. Nico Rosberg demonstating the conditions in his Mercedes. The second practice was extremely wet. So wet, that halfway into the 90 minute session, only two cars had gone out and set a time, firstly Timo Glock, with a time of 2:11.964. Bruno Senna then set a time of 2:10.215, before telling his team on the radio that doing laps in the conditions was pointless. Once the rain stopped, though, things started to happen out on track, with Kamui Kobayashi one of the first out. He quickly set a time over six seconds quicker than Senna's time. Within fifteen minutes, the best time had fallen to 1:58.894, set by Kobayashi. Just after that, though, Senna had a crash, the car slipping away from him as he powered away down the Hangar Straight. The session was red flagged for a few minutes. By the end of the session, drivers were trying out the intermediate tyre. This was not at all quicker, as shown by Fernando Alonso, who could only manage the then-13th best time of the session on his first lap on the tyres. Sebastian Vettel managed to set a personal best first sector, but then made a mistake. Vettel soon cut across Glock, but the Marussia driver, on the wet tyre, managed to pass him. Alonso finished the session with an off-track excursion, clipping the barriers in the process. The fastest time was set by Lewis Hamilton, the McLaren driver setting a time of 1:56.345. Hamilton was using the wet tyre. Second was Kobayashi. Romain Grosjean, Daniel Ricciardo, Mark Webber and Pedro de la Rosa did not set times. The fastest time in a dry third practice was Ferrari's Fernando Alonso, who set a time of 1:32.167. This lap turned out to be the fastest lap of the weekend. The track was not completely dry at first, but dryed out as the session went on. Charles Pic had issues in his Marussia twice. The first, just after 20 minutes into the hour session, meant he stopped his car on track at Becketts, and brought out a temporary red flag. The second, at Stowe, with five minutes left, only brought out yellow flags. The other main bits of action involved Alonso and the Sauber drivers. Alonso spun at the final corner, Club, with about fifteen minutes left in the session. With ten minutes to go, Kamui Kobayashi, who was on for a very quick lap, went off at the final corner (like Alonso). Two minutes later, team mate Sergio Pérez went off-track and damaged his front wing. The session was a wet one, but only wet enough for intermediates. The rain had only started falling five minutes or so after FP3 finished, but then stopped, before beginning again five minutes before Q1 started. The twenty-minute session began with all 24 drivers out on intermediates almost immediately. The Q1 order was constantly changing, since the intermediate tyres were durable and thus drivers could perform a large number of laps on one set of tyres. Quite surprisingly considering the conditions, the first major incident happened in the last minute. Timo Glock spun on the start-finish straight and brought out yellow flags. This meant that drivers could not set a fastest final sector time, difficult to do in the improving conditions on track. The yellow flags affected Jenson Button, who was on for good lap that would have taken him through to Q2, but he slowed down, and did not manage to beat Nico Rosberg's time and was out of qualifying. Also out were the two Caterhams, Vitaly Petrov ahead of Heikki Kovalainen, then Glock, Pedro de la Rosa, Narain Karthikeyan and Charles Pic was last, outside of the 107% time. Sergio Pérez topped the timesheets at the red flag, but eventually came last in the session. The weather, already not good, took a turn for the worst for Q2. Even the wet tyre appeared to not be sufficient. Michael Schumacher went off at Becketts in the horrendous conditions. Eventually, after Fernando Alonso went off, and Lewis Hamilton nearly hit a Sauber, the session was red flagged, with just six minutes and seventeen seconds left. Sergio Pérez was the fastest at the time, with a time of 1:59.092, ahead of Hamilton and Nico Rosberg and Jean-Éric Vergne. During the break, the boredom was such that a few Mexican Waves took place in the pit lane. After 90 minutes, the session started up again. With dryer conditions, the times started to tumble downwards. As the chequered flag was waved, the most notable driver in the dropout zone was Alonso, but like most of the field, he was on a quick lap. Romain Grosjean managed to spin, bringing out yellow flags for the final sector, just like in Q1. Grosjean was safely through to Q3, but he would be unable to take part in it. Despite the yellow flags, Alonso managed to set the ninth quickest time of the session, and got in Q3. Hamilton set the fastest time, at 1:54.897. Unluckiest was Paul di Resta, who came in eleventh, his place in Q1 lost during the yellow flags. Also out was Kamui Kobayashi, Rosberg, Daniel Ricciardo, Bruno Senna, Vergne and Pérez, who was first during the red flag period, but last after it. Fernando Alonso took pole position in his Ferrari. In the final ten-minute session, the track conditions were good enough for intermediates. Fernando Alonso set pole position, with a time of 1:51.746, Ferrari's first pole since the 2010 Singapore Grand Prix, 32 races ago. Second was Mark Webber, just 0.047 seconds behind. This meant that the two championship leaders occupied the first two places on the grid. Third was Michael Schumacher, the German bringing his Mercedes home 0.274 seconds behind Alonso. Schumacher was followed by fellow German, Sebastian Vettel, who was 0.453 seconds behind Alonso. Alonso's team mate, Felipe Massa, was well over a second down in fith, while Kimi Räikkönen was over one and half seconds down on Alonso. Pastor Maldonado was 0.004 seconds quicker than Lewis Hamilton. They qualified seventh and eighth. Ninth was Nico Hülkenberg, who was over 2.5 seconds down on Alonso. Romain Grosjean did not compete in the session after going off in Q2, and would line up tenth before any penalties were taken into account. Fernando Alonso's pole was both his and Ferrari's first for nearly two years, and it put him in a perfect position to extend his championship lead. Charles Pic was allowed to race by the stewards, who took the extreme conditions into account. Nico Hülkenberg changed his gearbox, resulting in a five-place grid penalty. Pic also had a five-place grid penalty for changing his gearbox. The penalties received in the previous race by Jean-Éric Vergne (ten places) and Kamui Kobayashi (five places) were also implemented. After these changes, Hülkenberg fell to 14th, Kobayashi fell to 17th, Vergne fell to 23rd and Pic stayed 24th and last. Everyone from Romain Grosjean (9th) to Narain Karthikeyan was affected by the grid penalties, moving up either one or two positions. * Nico Hülkenberg dropped 5 places due to a gearbox change. † Kamui Kobayashi dropped 5 places due to causing a collision in the last race. ‡ Jean-Éric Vergne dropped 10 places due to causing a collision in the last race. § Charles Pic dropped 5 places due to a gearbox change. Pic did not set a time within 107% of the fastest Q1 time, but was allowed to race. ** Vitaly Petrov did not start (engine). Paul di Resta's race was ended early after Romain Grosjean gave him a puncture. Before the cars took to the grid, the engine in Vitaly Petrov's car suffered an oil leak, and he was unable to take part in the race. At the start, Fernando Alonso held off Mark Webber, cutting across the track. Felipe Massa overtook Sebastian Vettel for fourth, and started pressuring Michael Schumacher. Pastor Maldonado also gained a place, overtaking Kimi Räikkönen. Later on during the lap, Romain Grosjean clipped the right rear tyre of Paul di Resta, and the Force India driver went off the track with the resulting puncture. Di Resta pitted, but the floor of his car was terminally damaged and he retired from the race. On lap three, Grosjean also pitted to replace his front wing to put on the prime tyres, and a result he fell to last place. By lap nine, Alonso had built up a lead of about two seconds over Webber, who had a similar gap to Schumacher, who was holding up a train of cars, with Massa leading the charge. Vettel pitted on lap ten, rejoining in fifteenth place behind Daniel Ricciardo. The next lap, Massa passed Schumacher for third, and both Maldonado and Sergio Pérez pitted. Pérez attempted to pass the Williams driver after the DRS zone, but the Venezuelan suffered a bit of oversteer and crashed into the Sauber. The Mexican was forced to retire, but Maldonado continued, but effectively, his race was over and any chance of pointscoring had disappeared. Due to the positioning of the accident, DRS was disabled for two laps. Schumacher pitted after being overtaken, taking on the hard tyre. Massa and Räikkönen pitted a lap later. On lap 14, Webber pitted, and on lap 15, Alonso pitted from the lead. This left Lewis Hamilton in front. On lap 19, Alonso had caught up with Hamilton, but got past despite strong defense from the British driver. Alonso had completed his pass after the DRS detection point, but before the DRS zone, and he used the DRS down Wellington Straight. But to everyone's surprise, Hamilton managed to slipstream the Ferrari and take the place back at the end of the straight; unfortuanately though, he went wide, and Alonso took the place back. Hamilton pitted a few laps later on lap 21. Pastor Maldonado crashed into Sergio Pérez, ruining his race and forcing the Sauber driver into retirement. 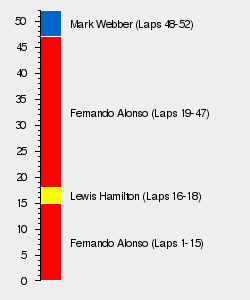 With all the pitstops completed, Alonso had retrained the lead and was still ahead of Webber. Vettel had performed the undercut on both Massa and Schumacher to take third place. Sixth was Räikkönen, ahead of Hamilton. Eighth was Grosjean, who was attempting to complete two long stints and had only pitted once on lap three. Ninth was Kamui Kobayashi, with Nico Hülkenberg rounding out the points. Eleventh was Bruno Senna, twelfth was Jenson Button. Nico Rosberg, in thirteenth, was the last of main pack. Ricciardo and Jean-Éric Vergne in the Toro Rossos were 14th and 15th. On lap 24, Schumacher lost two places to seventh as Räikkönen went past him with the aid of DRS, before Hamilton found his way past a few corners later. Räikkönen became the fastest driver on track. Back at the front, Alonso was pulling out a comfortable lead of about six seconds ahead of Webber. Grosjean finally pitted on lap 26. To cover, on lap 29, Hamilton pitted, after a stint of just eight laps. He fell behind Rosberg, but overtook the German into Copse. The next lap, Hamilton passed team-mate Button for 10th. Grosjean also finds his way past the out-of-form Button, who pitted at the end of the lap. Grosjean immediately starts attacking Hamilton, and he gets past on lap 35. Vettel pitted on lap 31, starting a string of pit stops by the front runners. Webber was the next, on lap 33, finishing the race on the harder tyre. Both Räikkönen and Schumacher pitted on lap 34, followed by Massa on lap 35. Massa's teammate, Alonso, pitted for the option tyre on lap 37, meaning he had to survive 15 laps on the softer compound, which was unlikely to last the distance at full race pace. Webber, on the more durable tyre, started closing in on the leader. When Kobayashi pitted on lap 37, he entered his pit box with too much speed, going slightly wide, and clattering into his mechanics on the right-hand side, before knocking the front jack man off his feet. Thankfully, no-one was seriously injured. After the final round of pitstops, the running order of the top 10 was Alonso, Webber, Vettel, Massa, Räikkönen, Grosjean, Hamilton, Schumacher, Hülkenberg and Senna. Button was 11th, followed by Kobayashi, Vergne, Ricciardo and Rosberg. Maldonado was nearly a lap down in 16th. Mark Webber went on to win the race. Webber was closing down on leader Alonso at over half a second a lap. It was becoming a question of when, and not if, Webber would get past the Spaniard. On lap 47, Webber got the gap down to just half a second. On this lap, Schumacher, who was also going very quickly, managed to overtake Hamilton with the aid of DRS. Then, on lap 48, Webber got past Alonso, for the lead, with a DRS overtake. Alonso was trying to make his tyres last too long, and unfortunately paid the price. With three laps remaining, Senna attempted to overtake Hülkenberg for ninth. The Brazilian got past at Brooklands, before Hülkenberg ran wide at Copse, losing two more positions to Button and Kobayashi, and falling to twelfth. Webber went on to win the race, which would ultimately prove to be his final victory in F1, finishing 2.5 seconds ahead of Alonso. Vettel claimed the final podium place. Fourth was Massa, his best finish since his third place at the 2010 Singapore Grand Prix. Fifth was Räikkönen, less than a second behind Massa. Grosjean completed a strong recovery by coming in sixth. Schumacher was seventh and Hamilton was eighth, followed by Senna and Button, who took the final point. Kobayashi came 11th, ahead of the unlucky Hülkenberg. Thirteenth was Ricciardo, who overtook Vergne with a few laps to go. Rosberg was fifteenth. Maldonado, after his collision, came in a lap down in sixteenth. Heikki Kovalainen was the first driver of the new teams, in seventeenth, ahead of Timo Glock and Charles Pic. Pedro de la Rosa, who managed to complete a one-stop strategy, was twentieth; followed by his HRT teammate, Narain Karthikeyan. Mark Webber's win brought him seven points closer to Fernando Alonso, whose lead was now thirteen points. Sebastian Vettel overtook Lewis Hamilton in the championship battle; Vettel was now third. In the Constructors' Championship, Red Bull-Renault held their lead, but second was now Ferrari, after a 2nd place and a 4th place. Lotus-Renault were third, and McLaren-Mercedes were behind them by two points, capping off a disappointing weekend by falling two places in the championship. Pastor Maldonado was given a fine of €10,000 (euros) for his collision with Sergio Pérez. Kamui Kobayashi was given a fine of €25,000 for his pitstop mishap, which could have serious injured four members of the Sauber pit crew. Final win for Mark Webber. This was the Formula 1 Wiki's Featured Article on 1 March 2013.